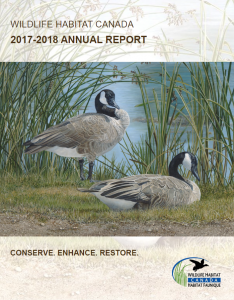 In 2017, WHC celebrated three remarkable moments in history: Canada’s 150th anniversary; the 100th anniversary of the Migratory Birds Convention Act, and the 33rd Canadian Wildlife Habitat Conservation Stamp and Print, featuring the painting “Tranquil Waters-Canada Geese” by Canadian artist, Angela Lorenzen. Thanks to the thousands of waterfowl hunters and others in Canada who purchase the Stamp, WHC is able to conserve, enhance and restore wildlife habitat across the country. The money from Stamp sales enabled WHC to invest $1,280,136 in grants to 44 different projects. This allowed us to leverage more than $6.97 million in additional partner revenue to support conservation activities. The result? More than 11,735 hectares (29,000 acres) of valuable wildlife habitat being conserved, enhanced or restored through the efforts of more than 30,000 participants.